Michael T. McRaith was appointed the Director of the Federal Insurance Office (FIO) in June 2011. As Director of FIO, McRaith advises Treasury Secretary Jacob Lew on domestic and prudential international insurance matters of importance. The FIO monitors all aspects of the insurance sector, including access to affordable insurance for traditionally underserved communities and consumers, minorities and low- and moderate income persons. McRaith also serves as a non-voting member of the Financial Stability Oversight Council (FSOC). Director McRaith is responsible for coordination of Federal efforts and the development of Federal policy on prudential aspects of international insurance matters. As FIO Director, McRaith represents the United States at the International Association of Insurance Supervisors (IAIS) and in other bi-lateral and multi-lateral international insurance matters. 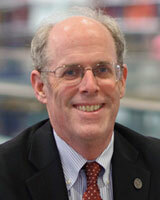 McRaith also serves on the IAIS Executive Committee and as Chair of the IAIS Technical Committee. Immediately prior to his appointment as FIO Director, McRaith served more than 6 years as the Director of the Illinois Department of Insurance. Prior to his public service, McRaith practiced law for fifteen years in Chicago where he specialized in the defense of financial institutions in commercial litigation. McRaith received his J.D. from Loyola University of Chicago in 1990, and his B.A. from Indiana University in 1986. McRaith serves on the Boards of Directors for the American Foundation for Suicide Prevention – Chicago Chapter, and the AIDS Foundation of Chicago. Senator Heidi Heitkamp (D-ND), is the first female Senator elected from North Dakota. She took the oath of office on January 3, 2013. A member of the Senate Banking Committee, she works to reform the nation’s housing finance system and make housing more affordable. As a member of the Senate Committee on Small Business and Entrepreneurship, she works on issues critical to small businesses. Senator Heitkamp sits on the Senate Committee on Agriculture, Nutrition, and Forestry, the Senate Committee on Homeland Security and Governmental Affairs which has oversight over government operations generally and the Department of Homeland Security and the Senate Committee on Indian Affairs. Senator Heitkamp previously served as North Dakota’s Attorney General and North Dakota’s Tax Commissioner. Under her tenure, the State of North Dakota attempted to make catalog retailers collect the sales tax the state and municipalities were already owed on sales. As a former director of the one-of-a-kind Dakota Gasification synfuels plant, Senator Heitkamp has a long record of serving as a champion for North Dakota’s energy jobs and industry. She is continuing those efforts in the Senate, working to responsibly harness North Dakota’s energy resources, and promoting the state’s all-of-the-above energy plan which she believes should serve as a model for the entire country. Congressman Randy Neugebauer (R-TX) represents the 19th Congressional District of Texas, which stretches across 29 counties in West Texas and the Big Country. He has offices in the cities of Abilene, Big Spring and Lubbock. As one of the most conservative Members of Congress, Randy works to keep Washington accountable to hardworking American taxpayers by requiring commonsense spending and borrowing limits. Randy serves on three committees in the House of Representatives, where he works on legislation that directly benefits his constituents. He is a senior member of the House Agriculture Committee and the House Science, Space, and Technology Committee. Additionally, he serves as the Chairman of the House Financial Services Subcommittee on Housing and Insurance. As Housing and Insurance Subcommittee Chairman, he’s working to reform the housing market, cut regulatory burdens, and shift risk away from American taxpayers and back into the private sector. Randy’s legislative initiatives include eliminating wasteful federal spending, improving crop insurance, and supporting diverse domestic energy sources. He continues to work on legislation that will empower the constituents of the 19th Congressional District. Monica J. Lindeen was unanimously elected President-Elect of the National Association of Insurance Commissioners (NAIC) in December 2013. Prior to that she had been elected Vice President in November 2012. She was also appointed to the Federal Insurance Office Advisory Board, which aids the office’s director in monitoring the insurance industry. She is a member of the System for Electronic Rate and Form Filing (SERFF) Board and the National Insurance Producer Registry (NIPR) Board of Directors. Lindeen was elected Commissioner of Securities and Insurance, Montana State Auditor, in November 2008 and reelected in 2012. Her mission is to protect securities and insurance consumers through education, fairness and transparency. During her tenure, her office has returned more than $200 million to investors and insurance consumers throughout the state. In 1999, Lindeen began her career in public service representing a rural district in the Montana House of Representatives. Due to her hard work in the legislature, she earned a reputation as a common-sense moderate who could get things done. She quickly became a leader in the House and served four terms (1999–2006). Prior to public service, Lindeen founded a highly successful business, Montana Communications Network (MCN), one of the first Montana-based Internet providers. From 1994 to 1996, she was a part-time faculty member in the Montana State University–Billings English Department and taught as a graduate assistant in the MSU–Billings Department of Educational Foundations. Peter G. Gallanis became President of the National Organization of Life and Health Insurance Guaranty Associations (NOLHGA) in April 1999. NOLHGA, formed in 1983, coordinates activities of its member state guaranty associations and their member companies (the entire U.S. life and health insurance industry) for insolvencies of life and health insurers. Mr. Gallanis is responsible for all of the financial, legal, strategic, educational, communications, and administrative services that NOLHGA provides. Before joining NOLHGA, Mr. Gallanis was Special Deputy Receiver (SDR) for the State of Illinois, managing the administration of approximately 80 insolvent insurers of all types. He became SDR in 1995 and had been General Counsel to SDR since 1992. Earlier, he was a Partner in a large law firm in Chicago, where he was in private practice from 1978 through 1991. Mr. Gallanis also served as Adjunct Professor of Insurance Law at DePaul University College of Law in Chicago from 1992 through 1999. He received a Bachelor’s degree from the University of Chicago and a law degree from the University of Illinois College of Law. He is admitted to practice before the Supreme Courts of the United States and Illinois. Mr. Gallanis has frequently participated in receivership legal proceedings; has lectured and published on insurance topics in the United States and in England, Canada, Switzerland, and Bermuda; and has testified on insurance legislation to Congress and state legislatures. Martin F. Grace is the James S. Kemper Professor of Risk Management and Associate Director and Research Associate at the Center for Risk Management and Insurance Research at Georgia State University. Dr. Grace’s research has been published in various journals in economics and insurance concerning the economics and public policy aspects of insurance regulation and taxation. In particular, Dr. Grace has undertaken various studies of the efficiency of insurance firms, insurance taxation, optimal regulation of insurance in a federal system, and solvency regulation. Dr. Grace is a former president of the Risk Theory Society, and he is a current associate editor of the Journal of Risk and Insurance. Grace’s areas of interest include insurer solvency, regulation and taxation. He has provided advice and research to the World Bank and to members of the European Parliament on the U.S. insurance industry. His articles have appeared in numerous economic and insurance related academic journals. Dr. Grace earned both a Ph.D. in economics and a J.D. from the University of Florida in 1987. He joined the faculty of the Department of Risk Management and Insurance as an assistant professor of legal studies in the fall of 1987. In 1993 Dr. Grace was promoted to associate professor with appointments in both Legal Studies and Risk Management and Insurance. In 1998 Dr. Grace was promoted to Professor of Legal Studies and Risk Management and Insurance, and in 2002 Professor Grace was named the James S. Kemper Professor of Risk Management. Due to circumstances beyond anyone's control Dr. Grace was unable to speak at the Summit. Tim Pawlenty is the Chief Executive Officer of the Financial Services Roundtable, which represents 100 of the largest integrated financial services companies which provide banking, insurance and investment products and services to American consumers. As a former two-term Governor of Minnesota, he is a leader with significant executive experience having overseen a $50 billion biennial budget, led 30,000 state employees, and managed 20 individual state agencies and departments. As chair of the Minnesota State Board of Investment, Governor Pawlenty directed more than $60 billion in public and private investments during his tenure. As Governor, his education, healthcare, and energy initiatives were widely viewed as among the most innovative in the nation. He served as chair of the National Governor’s Association from 2007-2008 and chair of the Midwest Governor’s Association from 2006-2007. Governor Pawlenty is nationally respected as a serious policymaker who combines his depth of subject matter knowledge with a unique ability to communicate on complex issues. He is recognized as one of the foremost thought leaders in the country and the financial services industry. Andrés Portilla is the Director of Regulatory Affairs at the Institute of International Finance (IIF) which he joined in May, 2002. Mr. Portilla has over 18 years of experience on financial regulatory issues and has led advocacy activities on regulatory capital and liquidity regulations, particularly, those involving standards issued by the Basel Committee. In his native country, Colombia, he occupied positions in the regulatory affairs departments at the national Banking Association as well as commercial banks. He also practiced law in the area of banking and financial markets. He holds a JD and a Specialized Degree on Banking Law from University of Rosario in Colombia. It can also be found on SlidePlayer. Leigh Ann Pusey is the president and CEO of the American Insurance Association (AIA). She oversees the organization's operations and works directly with AIA’s Board of Directors to develop and guide the strategic mission of the association. AIA is the leading property-casualty insurance trade organization, representing 300 insurers that write more than $117 billion in premiums each year. A veteran of the insurance industry, Ms. Pusey joined AIA in December 1996 and was elevated to president and CEO in February 2009. Previously she served as chief operating officer and senior vice president of government affairs where she was responsible for the association’s government affairs department and AIA’s interests before Congress and state legislatures on all matters of importance to the property-casualty industry. She began her tenure with the association as senior vice president for public affairs. Recognizing her prominence and leadership within the industry, Business Insurance Magazine has listed Ms. Pusey among their "Women to Watch." In addition, Ms. Pusey is consistently recognized by The Hill publication as one of the top lobbyists in Washington, D.C. She is frequently quoted in the news media and consulted by policy makers and Wall Street for her views on issues facing the property-casualty industry. Charles T. Richardson is a partner in the Washington, D.C. office of the law firm of Faegre Baker & Daniels LLP with other offices in Indiana and China. He chairs the Firm's Insurance and Financial Services Practice Group. Charlie concentrates his practice in both corporate/regulatory and insolvency areas of the insurance practice. In the corporate/regulatory arena, Charlie assists insurance companies with change in control proceedings, all types of regulatory, agent, policy approval, accounting, mergers and acquisitions, market conduct and reinsurance. He practices in the area of insurance company rehabilitations and liquidations, including representation of the National Organization of Life and Health Insurance Guaranty Associations and serves on NOLHGA's Legal Committee. He is a Qualified Independent Assessor of the Insurance Marketplace Standards Association. Charlie is a frequent speaker and author on insurance subjects and has been active in committees and working groups of the National Association of Insurance Commissioners. He is on the Advisory Board of Networks Financial Institute of Indiana State University and is a past Vice President and Director of the Federation of Regulatory Counsel and Chairs its Admissions Committee. Charlie is a graduate of the University of Michigan Law School and Indiana University. 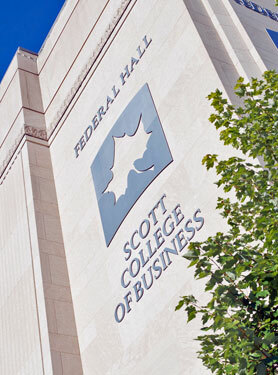 Brien Smith is dean of the Scott College of Business at Indiana State University and Acting Executive Director of Networks Financial Institute. He was previously associate dean for the Miller College of Business at Ball State University. Smith attained his PhD in industrial/organizational psychology in 1989 from Auburn University. He has 20 years of administrative experience in higher education and has actively participated in university governance. Smith previously served as the chair for the Department of Marketing and Management, assistant to the dean for graduate programs, and vice chairperson of the Department of Management. Smith published numerous articles in refereed proceedings and journals, including some of the best journals in the field: Journal of Applied Psychology, Journal of Applied Social Psychology,Group and Organization Management, and Journal of Business and Psychology. He has delivered presentations and speeches at national and international conferences. He has 10 years of leadership experience in the Ball State University Senate, including senate chair (twice) and faculty council chair. He is a coauthor of the current Ball State University Senate Constitution (Senate Reorganization Committee), teaches courses in human resource management, and was named the 1994-1995 Ball State University Teaching Professor (now known as the Excellence in Teaching Award). Peter J. Wallison holds the Arthur F. Burns Chair in Financial Market Studies and is co-director of American Enterprise Institute's (AEI) program on Financial Policy Studies. Prior to joining AEI, he practiced banking, corporate, and financial law at Gibson, Dunn & Crutcher in Washington, D.C., and New York. Mr. Wallison has held a number of government positions. From June 1981 to January 1985, he was general counsel of the United States Treasury Department, where he had a significant role in the development of the Reagan administration’s proposals for deregulation in the financial services industry, served as general counsel to the Depository Institutions Deregulation Committee, and participated in the Treasury Department’s efforts to deal with the debt held by less-developed countries. During 1986 and 1987, Mr. Wallison was White House counsel to President Ronald Reagan. Between 1972 and 1976, Mr. Wallison served first as special assistant to New York’s Gov. Nelson A. Rockefeller and, subsequently, as counsel to Mr. Rockefeller when he was vice president of the United States. Author of several books, he is a frequent contributor to the op-ed pages of New York Times, Wall Street Journal, and Financial Times. He has been a speaker at many conferences on financial services, accounting, and corporate governance, and is a member of the Shadow Financial Regulatory Committee and the Council on Foreign Relations. "The Authority of the FSOC and the FSB to Designate SIFIs: Implications for the Regulation of Insurers in the United States after the Prudential Decision"